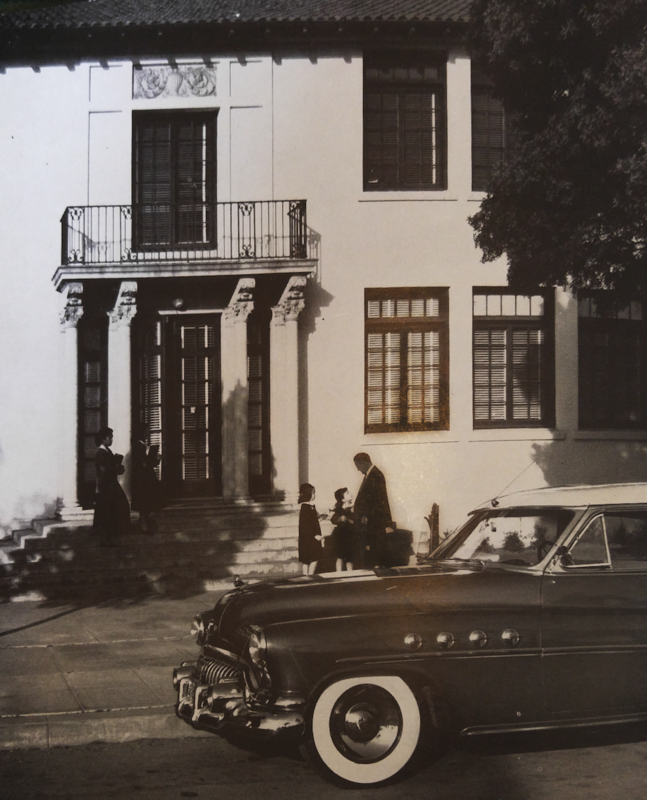 4th in a series about OLP’s History. Read the previous installment here. Photo: St. Aquinas Hall in 1930. After a night spent in prayer on January 24, 1924, the Sisters were able to obtain the Oregon Street property and on January 25, 1924, the San Diego Union announced the sale of the Van Druff estate to the Sisters of St. Joseph of Carondelet. The property was purchased for $77,500. At the time of its purchase, the Van Druff Estate consisted of only three buildings, which are now Carondelet Hall, St. Catherine’s and St. Cecelia’s. The Sisters realized those buildings would be inadequate facilities for the students who attended Villa Montemar (“House by the Sea”), the Academy’s sobriquet. Plans to expand the school’s capacity began in 1924 and the construction on three new buildings ended in 1927. The Sisters hired San Diego architect Ilton E. Loveless (August 10, 1892-March 27,1973) to design the three additional buildings. Loveless and his wife, Margaret, arrived in San Diego in 1919. He worked for the Navy until 1924 when he opened his own architecture office at 121 Broadway. The buildings were designed in an Italian Renaissance style to stay consistent with the architecture of the existing buildings. The San Diego contracting firm of Lowerison and Wolstencroft was charged with the building construction. John E. Lowerison had been a contractor in San Diego with his partner and adopted son, Herbert A. Wolstencroft (1887-1965). They worked together on several projects with Loveless, including the restoration of the San Diego Mission and the building of Nazareth House and Nazareth School, both located on the grounds of the Mission. Coincidentally, Herbert A. Wolstencroft lived close to OLP, at 3995 Oregon Street. The first school building on Villa Montemar’s grounds, called Aquinas Hall, contained classroom space for the 250 grammar school and high school students. Its budgeted cost was $74,000. Governed by a separate principal, the population of elementary school students exceeded high school enrollment in the early years of OLP. Grammar school students participated in all activities of the school. Our very own Jeanette Handelsman ’64 started OLP in kindergarten. She is pictured here with her cousin, Karen Boggio ’64, as her father, Mr. Prantil, drops them off at Aquinas’s front steps. With the growth of the K-8 parochial school system in San Diego, the need for the grammar school at OLP gradually diminished. The Class of 1966 was the last class to graduate students who began their OLP education as kindergarteners. The second building, St. Margaret’s Hall, was originally utilized as a dormitory for boarders and built at a cost of $50,000. When the dormitory opened, students paid $125 per year for a private room. Following the close of the dorm in 1973, the basement floor remained in use as a gymnasium but the upper floors of the building were rarely used until 1994. St. Margaret’s Hall, renamed Qualiato in 1994 after the parents of the major donor, currently houses seven classrooms and the faculty room. The basement floor now houses the dance studio and functions as a major component of storage for the Visual and Performing Arts Department. The crown jewel of OLP is the Chapel. The site of innumerable masses, student liturgies, alumnae weddings and baptisms of alumnae children, the Chapel was constructed for just $24,000. The pews are solid mahogany and the choir loft boasts a built-in pipe organ console. Artisans visited San Diego five times to measure the space under the arched ceiling for the altar. The measurements were sent to Italy where the altar was hand-carved of pure Carrera marble. Relics of St. Tranqullini and St. Blas II were placed in the altar.